Steven (Chicagoland, United States) on 26 January 2017 in Landscape & Rural and Portfolio. Steam rises from the waters of Lake Michigan just outside of Waukegan Harbor. This view is looking directly east down the long breakwater. It's really cold morning looking. 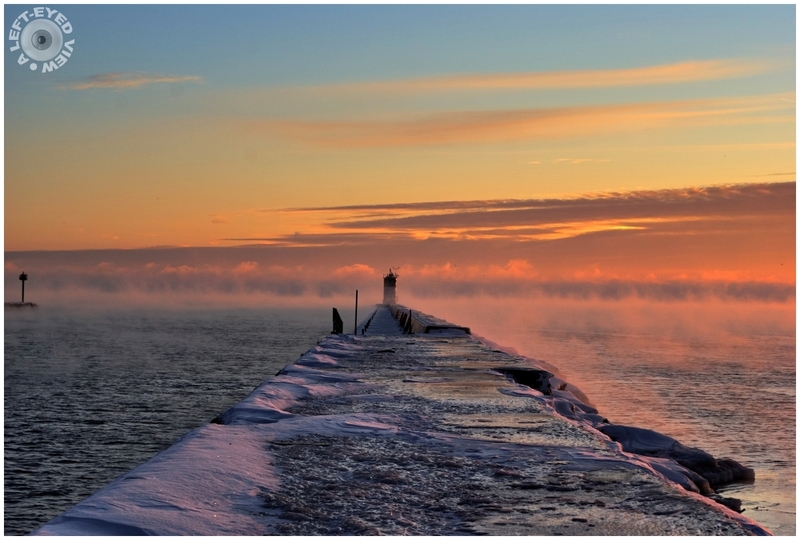 Sea Smoke, colors of the sky and the snow reflected the blue create a great color scheme. Quelles couleurs magnifiques ! Jolie composition. This is spectacular ! The colours are amazing and I can sense the place directly through the image. A wonderful capture of this cold morning's beautiful sky. Stunning point of view. I love the colors and mood. Brrrrrr, that is cold! The sunrise colors are beautiful mingling with the cloud-like vapors, very pretty! Oh, my. I can feel the cold streaming from this image. Well done. Fantastic! A gorgeous image of the cold early morning. I like that breakwater. Oh wow, this is a real stunner! The iced-over wall leading into a burning sky ... absolutely fantastic! Slendide !!! Merci Steven ! Wonderful photo! Great light, fine tones and superb mood. I can feel the chill in the air. That is an excellent point of view shot made better with that great mist. This is just gorgeous. The sky is beautiful! It must have been really cold standing out there! A beautiful image! Ce ponton avec la glace ce ciel en fond splendide vue. Un trésor sorti des archives ! Des couleurs superbes ! Very nice shot! Wonderful colours. Beautiful landscape. Superb winter atmosphere. Une image d'une beauté magique! An image of magical beauty! Magnificent !! Amazing colors and great perspective. Congratulations on the spotlight. Impressive and very beautiful ! such beautiful composition, perspective, clouds, colors, lights & atmosphere! This is a fabulous capture. The light is beautiful. Excellent choice for the Spotlight! Congratulations. A superb image in that wonderful light - Congrats on the Color Spotlight ! Bravo pour ton spotlight color!!! Foto muito bem conseguida parabéns. Wow so spectacular and I love your colors ! Wonderful light and the presence of the mist embellished, even more, the photo. che colori e che splendore di prospettiva! un invito a partire per un mondo di fiaba! Very nice contrast between the pier and the warm colors of the sky.